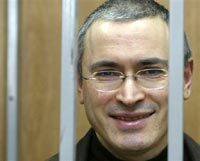 A Russian court ordered imprisoned oil tycoon Mikhail Khodorkovsky to stay in a Siberian jail for another three months, the latest setback in his lawyers' fight to get him transferred to Moscow in connection with a new investigation. A district court in the city of Chita ruled Friday that Khodorkovsky must remain in custody there to prevent him from "obstructing the investigation and hiding criminal evidence," the site said. Lawyers for Khodorkovsky, who is serving an eight-year prison sentence after a politically charged trial, have fought for his transfer from the Chita region on the Chinese border to Moscow amid a money-laundering investigation prosecutors opened in February. In March, a district court in Moscow rejected a decision by prosecutors to base the new investigation in Chita, and ordered that Khodorkovsky and his business partner Platon Lebedev, who faces similar charges, be moved to Moscow. That decision was upheld in April, but Khodorkovsky was never transferred. In July, his lawyers filed suit against two state prosecutors, accusing them of ignoring the court decision. Khodorkovsky, once Russia's richest man, was arrested in 2003 amid a tax inquiry that eventually put the oil company he founded, OAO Yukos, into state hands. He was convicted in 2005 of fraud and tax evasion and has been serving his sentence in the Chita region, about 4,700 kilometers (3,000 miles) east of Moscow. The trial and tax probe were widely seen as a Kremlin-driven campaign to punish Khodorkovsky for challenging President Vladimir Putin and to boost state control over the lucrative oil industry. The latest charges involve accusations that Khodorkovsky and Lebedev stole property worth US$34.3 billion (EUR24 billion) from Yukos subsidiaries. Khodorkovsky has denied the new charges, calling the case a "shameful farce." His legal team has long insisted the company's business structure was legal and meticulously audited by foreign consultants to meet international standards.